Floor Plan "Alder" - 1 Bedroom, 2.5 bathrooms, 868 Square Feet with two car garage. Floor Plan "Birch (2B)" - 1 Bedroom, 2.5 bathrooms, 1,023 Square Feet with two car garage. Floor Plan "Birch (2C)" - 2 Bedrooms, 2.5 bathrooms, 1,023 Square Feet with attached two car garage. Floor Plan "Cedar" - 2 Bedrooms, 2.5 bathrooms, 1,186 Square Feet with attached two car garage. Floor Plan "Maple" - 2 Bedrooms, 2.5 bathrooms, 1,363Square Feet with attached two car garage. Floor Plan "Maple (4F) - 2-3 Bedrooms, 2.5 bathrooms, 1,367 Square Feet with attached two car garage. Amenities include swimming pools, basket ball courts, Tennis Courts, club house, parks, play grounds for kids and families to have fun. 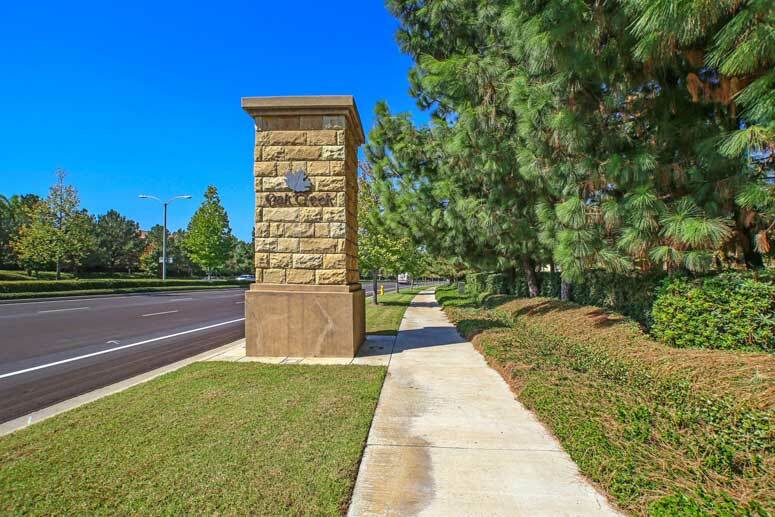 The Master Homeowner's Association to Oak Creek is Oak Creek Village Maintenance Association managed by Merit Property Management located on 1 Polaris Way Suite 100 Aliso Viejo CA 92656. Their contact information is Tel: 949.448.6000. Parks association are served by Oak Park Maintenance Association managed by Action Property Management located on 2603 Main Street Suite 500 Irvine CA 92614 and their contact number is 949-450-0202. The Sub-HOA is Oak Park Maintenance Association managed by Action Property Management located on 2603 Main Street, Suite 500 Irvine California 92614. Their contact number is (949) 450-0202. Current Association Dues are approximately $177 and $80 per month respectively. So if looking to buy or lease in Oak Park in Oak Creek then, please, have a look around, and contact us with any questions you might have.